This "Historically Speaking" column appeared in the Exeter News-Letter on Friday, April 27, 2012. When the world commemorated the 100th anniversary of the sinking of the Titanic, the Exeter Historical Society did not. Except for a few little teasers on our Facebook feed, there was no mention of the event – no guest speaker, no local tie-in and no column in the Exeter News-Letter about what people thought about the event back in 1912. Did we miss something? It wasn’t for lack of trying. We searched the archives for some sort of local response, but found none. Helen Tufts, who kept a diary for nearly all of her ninety years in Exeter, was 15 years old in 1912. Her entries for the week the Titanic sank are full of local events, but silent on the one big international story of the week. From her we find out that April 16th – the day after the ship went down – the weather in Exeter was “Hot”. There were thundershowers in the afternoon and Helen had to stay at school until 4:30 because she didn’t bring her umbrella. The unseasonal heat and perhaps seasonal allergies combined to give her a terrible sore throat the following day, but she didn’t add ‘at least I’m not clinging to an ice floe in the freezing North Atlantic’ to her entry for the day. The Portsmouth Herald, a daily paper, ran a front page headline and story on Tuesday – “OCEAN LINER TITANIC SINKS: GREAT LOSS OF LIFE.” The Herald kept the story alive on the front page for another four days before deciding the public had had enough. The final front-page headline read: “TITANIC SANK AS BAND PLAYED ‘NEARER MY GOD TO THEE,’” and then the story sank as well. 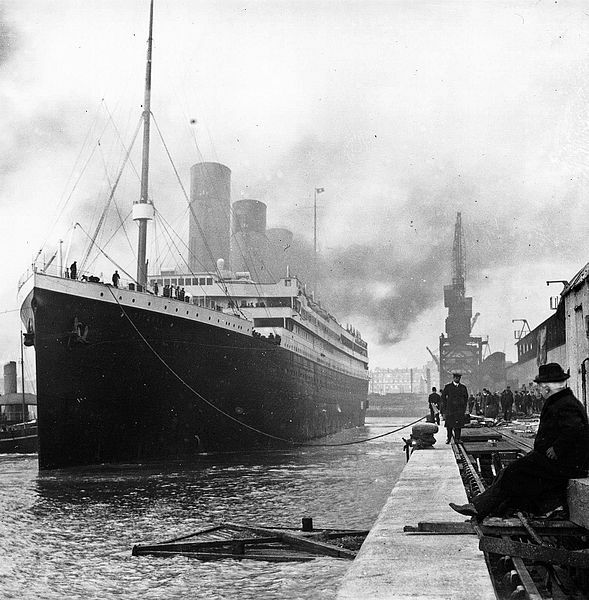 The Exeter News-Letter, then a weekly paper, ran a story about the Titanic on Friday, April 19th. The problem with a weekly paper is that sometimes events are already old news before they can be published. By the time the story ran most people already knew about it from other sources. The restrained headline read; “Appalling Marine Disaster.” John Templeton, the editor, then managed to condense the tragedy in his impeccably well written first sentence, “More than 1500 persons, it is feared, sank to their death early Monday, when within four hours after she crashed into an iceberg, the mammoth White Star line steamer Titanic, the largest vessel ever built, bound from Liverpool to New York on her maiden voyage, went to the bottom of the Newfoundland banks.” A few more small facts were added before he summed it up with a single sentence: “The money loss is enormous.” Until the movie came out in 1997, the Titanic was never mentioned again in the Exeter News-Letter. It was just another sunken ship. And yet, when Charles Bell sat down to write “A History of Exeter, New Hampshire” in 1888, he barely mentioned the War of 1812. It had been forgotten, consumed by the Civil War fought nearly fifty years later. In a way, the War of 1812 disappeared from nineteenth century history with the same ferocity that the story of the Titanic would later emerge as one of the pivotal events of the twentieth. By the 1880s, no one remembered veterans who’d fought in the War of 1812, but you couldn’t get elected to office if you hadn’t served during the Civil War. Strangely similarly, someone living in 1930 might vaguely recall the sinking of the Titanic, but by the 1980s even children knew that the ship once called ‘unsinkable’ didn’t have enough lifeboats for everyone and its sinking was a very metaphor for human hubris. All of this highlights how slippery history can be. The Civil War overshadowed the War of 1812 and the Titanic disaster only became important decades after it happened. Ignored history sometimes reemerges when we need it, but it also sometimes remains ignored. Even now we are more focused on the 150th anniversary of the Civil War – marking every battle fought – than we are on the bicentennial of the War of 1812. Our view of history, it seems, says more about our current needs than on events as they originally happened.